Hi Vladimir, tell us who you are and what lead you into microservices? 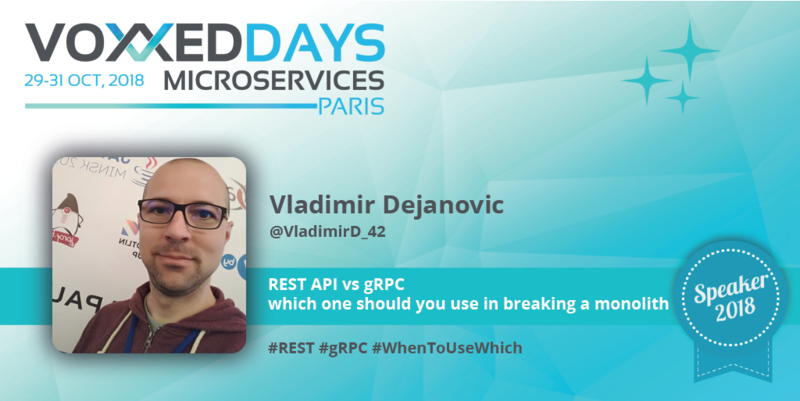 I will take a look at REST and remote procedure call (gRPC to be more precise), which are common approaches in breaking up a monolith once people go towards microservices. I will share my knowledge and try to explain what are the differences between them and try to answer important questions when you should use one and when other for breaking up a monolith. When we talk about RESTful architecture we think of embracing the HTTP protocol, using HATEOAS and other design patterns. When talking about gRPC we think of binary protocol. Why opposing REST and gRPC? Can’t they play well together? They can go hand to hand very good. Main goal of my talk isn’t to say one or other is better, but more to give explanation of both approaches, where they are similar where they differ, and give answers to precisely this questions, when you should use one, when other and how to combine them to get the best result. Looking forward to see you all for great time and sharing the knowledge.